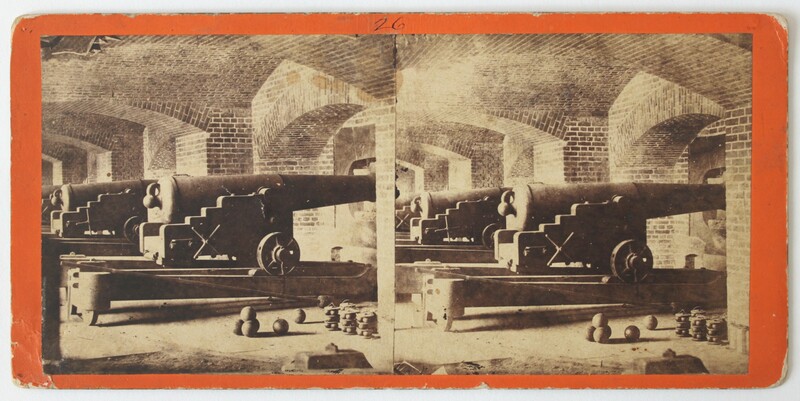 Item description: Two stereo views depicting the interior of Fort Sumter following the 14 April 1861 surrender of the fort. These pictures are attributed to the Charleston photographic establishment of “Osborn & Durbec’s Southern Stereoscopic and Photographic Depot,” operated by James M. Osborn and F.E. Durbec. Item citation: From folder 222(b) of Miscellaneous Pictures, #4090, Southern Historical Collection, The Wilson Library, University of North Carolina at Chapel Hill. More about this item: According to noted historian of Civil War photography, Bob Zeller, in his 1997 study, “The Civil War in Depth: History in 3-D,” Charleston photographers James M. Osborn and F.E. Durbec were among at least four photographic outfits to have visited and photographed the aftermath of the bombardment of Fort Sumter, meaning that they were among the first photographers to document the war. Osborn and Durbec arrived at Fort Sumter on 17 April 1861 and produced at least twenty stereo views there before heading out to Sullivan’s Island, Fort Moultrie, and Morris Island, where they created at least thirteen more images, and exposed at least five more wet-plate stereo negatives. More stereo views may exist, still to be rediscovered. We rediscovered these two stereo views in our Miscellaneous Pictures collection and, after further research and consultation with the Louisiana Historical Association Collection at Tulane University (home to the most complete set of these Osborn and Durbec prints), we concluded that these two images in our collection were indeed among those that were created on this visit to the Fort. This entry was posted in Southern Historical Collection and tagged Charleston, F.E. Durbec, Fort Sumter, James M. Osborn, photographs, photography, South Carolina, stereographic views. Bookmark the permalink. The first shot looks awfully clean for just a few days after a battle. Plus I seem to remember there was a large fire. Are you confident on the date? 1. The finding aid for the collection that houses these images has them listed as, “scenes of Fort Sumter, 1864-1865.” We originally took this at face value and we were planning on showing them on this blog at some point in 2014 or 2015, but we wanted to know the exact date so we started researching. Did the photographers or soldiers stage the scene around the cannons? Or was this simply an undamaged portion of the fort? Why does our print say “No. 20” of the series while the image at Tulane says “No. 12”? Are there more images out there that are a part of this series? We’d love to know more and would appreciate any more information that anyone can provide! Here’s an absolute guess: These were eastern pointing guns. Plausible that they would have neither been fired nor touched by Confederate fire. (There’s probably a couple of gaping holes in that — I’ve never even been to Sumpter. Like your blog. Doing North Carolina proud. Thanks, Chris. We’re glad you like the blog. That does sound like a plausible explanation. I’ve also never been to the Sumter historic site, but it’s possible that this was just one of the casemates that was used very little (or unscathed by Confederate shells). I really think these photographs would make for a great research project for a student or someone else: to compare the images with other known images taken that week of April (there were at least 4 photographers that got special passes to take a boat to the fort to take photographs then), comparing the images with site plans of the fort. From folder 222(b) of Miscellaneous Pictures, #4090, Southern Historical Collection, The Wilson Library, University of North Carolina at Chapel Hill. One angle to pursue is to find out if Osburn & Durbec ever photographed Fort Sumter *before* the war. If so, they could have supplemented their post-attack images, and renumbered their series. Just speculating, because I know nothing about the firm’s work. For another Osburn & Durbec view of Sumter, see the Center for Civil War Photography (founded by Zeller and others) webpage at http://www.civilwarphotography.org/index.php?option=com_content&view=article&id=69&Itemid=87. The article says, “Osborn and Durbec were among the most active Southern photographers in 1860 and 1861,” so it may well be that they also visited Fort Sumter before the siege—an hypothesis worth exploring. Good point, Stephen. The difference in series numbering between our print and the print at Tulane might indicate that the firm was loosey-goosey with their construction of the series. I’ll see if I can pass these images along to folks at the Fort Sumter Historic Site…maybe they’d be able to weigh in. Great post here. It was just brought to my attention (June 8). These are indeed vintage, original Osborn & Durbec albumen stereo prints, dating to 1861, and both carrying the classic backmark with the distinctive “Southern Stereoscopic & Photographic Depot” title. These views are ultra rare. I know of only two extensive holdings of this series — Tulane and our Center for Civil War Photography member Robin Stanford. I don’t think either are fully complete. Your display appears to show the front of No. 19, then the back of No. 20. The second stereo photo is No. 20 and it is displayed here upside down. Then you have the back of No. 19. Robin Stanford owns vintage original prints for both of these and her No. 19 is the interior photo with the cannons and her No. 20 is the exterior shot with the damage, except the opening for the cannon is on the left and the shell damage is on the right. The information I had in Civil War in Depth is outdated. Only two Charleston photographic firms photographed Fort Sumter after the April 1861 surrender. Photographer Alma Pelot, working for Jesse Bolles, went to the fort on April 15, two days after the surrender, and took a series of large plate images. His presence was documented in the Charleston Mercury the next day and later that month Bolles had the newspaper publish display ads for the images. We do not know the exact days J.M. Osborn of Osborn & Durbec visited the sites, but the April 23, 1861 Charleston Courier reported that he had been “allowed to visit Fort Sumter, andhas taken 26 different views of the fort, internal and external. Mr. Osborn has also visited Morris and Sullivan’s Island, and has taken several views of these points, all of which we may expect to see in a few days.” Stereo view cards exactly like those you have — on bright orange mounts with the O&D backmark — are exactly what was offered in those days after. These stereo views are as good as it gets in terms of Civil War photographic relics. They are among the very very few Confederate 3-D Civil War photos, and they are also among the very first images of the Civil War. For detailed info on photography at Fort Sumter throughout the Civil War, see my history of Civil War photography, The Blue and Gray in Black and White. By 1863, Osborn was working for George S. Cook, so the Osborn & Durbec Depot was in existence only from about 1859 or 1860 to about 1862. Some of the Fort Sumter stereo images by O&D were reprinted by several Charleston photographers in the years after the war, but the original negatives have disappeared. So it is vintage original prints like these that allow us to document the series. As far as the fort being photographed before the war, there are almost no known images, and no particularly good ones. But we did recently uncover one fascinating Osborn & Durbec stereo view taken in Fort Moultrie around August 1860 showing an undamaged Fort Sumter in the background. Interestingly, Osborn returned to that exact camera location in April 1861 and took another shot, and now you can see that Sumter is heavily damaged. We published this great ”then-and-then” pair in a recent issue of Battlefield Photographer, the CCWP newsletter. Thanks so much for your great comment. It is always very helpful to have additional description from scholars who know these materials best. I especially appreciate you pointing out the two errors in our display of these prints. I have now corrected the order of the 4 images (sequence now: front of #19, back of #19, front of #20, back of #20) and I have adjusted the orientation of the 3rd image (rotating the front of print #20 by 180 degrees). That one was misleading, as the label and the writing on the verso was “upside down.” Now that I see it this way, it makes much more visual sense. Of course, as an archivist, I hope that the all the extant prints from the series as well as the original negatives will show up some day (and that they will have survived the past 150 years)! By the way…you mentioned George S. Cook. We also have four prints of Sumter that have been attributed to Mr. Cook and that are dated ca. 1864. They show a great deal more damage on the interior of the fort. Perhaps as a result of the continued siege over those three years. We’d love to feature these prints as well, at some later date in our project. Would you consider taking a look at some scans of these, to see if you could assist us in dating them? I hate to trouble you…but maybe we could uncover something together. Thank you again for your thoughtful comments! Thanks for making such nice large images available. They free-view nicely! Even # 19( once it’s rotated 180 🙂 I guess whoever labeled it way back when didn’t have access to a stereo opticon viewer. There is additional info on the backs in pencil: “negative ——-” on # 20 , .and “negative A” on # 19. Over the near gun-port on #20 is the numeral “19”. This should help resolve which side of the fort these guns are on. Thanks again for some great viewing!